Made in the USA, ProBEAM® Headlamps offer the latest in engineering innovation with a modern and sleek design. Low beam consists of three high power advanced optical D lenses and a possition light. High Beam keeps low beam illuminated and adds two additional LEDs with advanced optical D lenses and three more LEDs with projector lenses for an incredibly wide optical pattern producing an ideal beam pattern with illumination down the road as well as on either side. 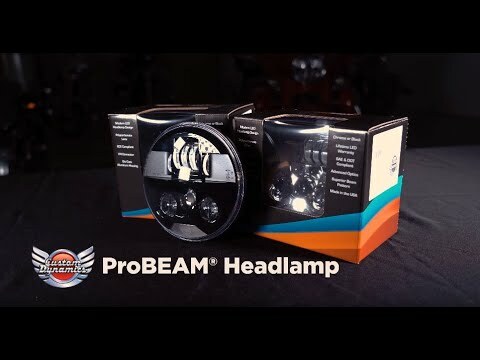 Custom Dynamics® ProBEAM® LED Headlamp is designed for plug and play installation on all Harley-Davidson® XL Sportster® models, 2015-2019 XG Street Models, and 2017-Earlier Dyna® models (except Switchback). Fits most Softail® models with 5.75" OEM headlamp buckets including Softail® Custom (FXSTC), Cross Bones (FLSTSB), Deuce (FXSTD), Deuce CVO™ (FXSTDSE), Springer (FXSTS), Heritage Springer (FLSTS), and Springer Classic (FLSTSC). Also Fits 2013-2014 Breakout CVO™ (FXSBSE) and 2016-2017 Pro Street Breakout CVO™ (FXSE). Additional Softail® Mounting Kit (CDTB-575ADK) required when installing on 2010-2012 Convertible CVO™ (FLSTSE) and 2005-2009 Night Train (FXSTB) with OEM P/N 69696-05 headlamp bucket and 2013-2017 FXSB Breakout, 2011-2013 FXS Blackline, and Rocker/Rocker C models with OEM P/N 67700029 headlamp bucket. ProBEAM® Headlamp also available in 7"diameter with matching Passing Lamps, as well as ProBEAM® with Metric Fitment. All Harley-Davidson® XL Sportster® models, 2015-2019 XG Street Models, and 2017-Earlier Dyna® models (except Switchback). Fits most Softail® models with 5.75" OEM headlamp buckets including Softail® Custom (FXSTC), Cross Bones (FLSTSB), Deuce (FXSTD), Deuce CVO™ (FXSTDSE), Springer (FXSTS), Heritage Springer (FLSTS), and Springer Classic (FLSTSC). Also Fits 2013-2014 Breakout CVO™ (FXSBSE) and 2016-2017 Pro Street Breakout CVO™ (FXSE). ProBEAM® Headlamp also available in 7" diameter with matching Passing Lamps, as well as ProBEAM® with Metric Fitment.